I have a million things to blog about. My computer is totally broken and I am crying angry tears and I kind of want to call Dell and complain but I know I'll just end up on the phone with some Indian guy named "Frank" who will put me on hold for 56 minutes and use up all of my cell phone plan time. I am borrowing Luke's work laptop but seriously? His keyboard? It's the worst keyboard I've ever used. Am currently SLAMMING my fingers into the keys and only every other letter shows up. How does he use this every day? Anyway. I got very little swag (seriously WHO CARES?) and totally took my baby to cocktail parties and listened to someone sing "You Oughta Know" karaoke style and hung out with some very lovely cool people and had a good time. I am so so thankful to my roommate Steph and friend Beth for their genorosity and encouragement. I never would have gone to Blogher without them. And I mean it. The whole thing was planned and executed at the eleventh hour. I am not going to analyze the event as that has already been done TO DEATH. I will say that I was very intimidated and homesick at first. And that I have had a bit of a knot in my stomach ever since arriving home, worrying that I made a bad impression. I have a knack for talking way way way too much when I feel like I don't know people well enough. I think I might have done that. I will also say that in my experience, what you see online? It's very accurate. The people I liked online I liked in real life. I was not disappointed. I spent a LOT of time with Meagan Francis who I will from now on think of as the big sister I never had because she shares many hilarious and random quirks with me. And nearly the same color of hair. And she starred as Kim MaCafee in her high school's production of Bye Bye Birdie and I'm not even making that up. I also got to hang out with Beth and Steph and Sarah and Heather and I met and saw almost everyone I wanted to (though many in this "met and saw" column would have ideally been in the "hung out with" column) and that and that alone was worth the drive to Chicago. One thing I did learn? My blog name is ridiculous and way too hard to repeat out loud. Watch for a move to a .com name that will knock your socks off. And I only say that because Luke came up with it and I love it and it's perfect and I will be excited to tell people I blog at ________.com. An experience for me and my baby and I'm glad it happened. Now I need to catch up on laundry. I will leave you with the only shots I took of Alice and Ivy, if you can even believe it. They were so incredibly cute together. 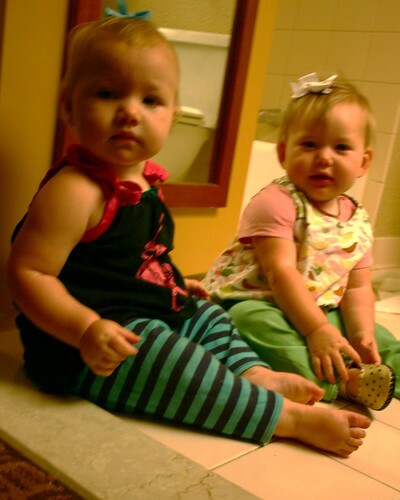 They followed each other around the hotel room and had little baby clapping parties where one would start clapping and then the other would clap too and then they would sit there all cute and girly-like, clapping together and looking at each other. I have a feeling they are going to be friends. Oh my gosh - baby arm chub! I had to go take toothpaste from Annabel in the middle of this comment and lost my train of thought. 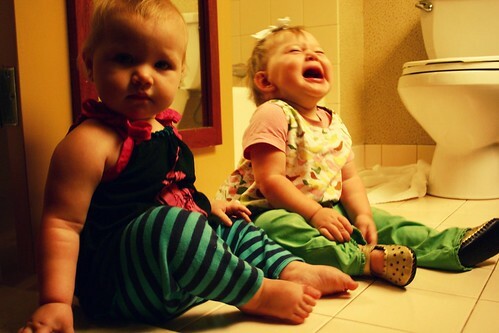 I am glad you had fun at Blogher and can totally relate to the talking too much when nervous. I will be screaming atmyself in my head to STOP TALKING, but I just can't do it. i'm so glad you had a great time. i hate that i can't see your stinking picturs on your blog at work. my work is dumb. I have been waiting on this post. :) Wondering what it was like. And just wondering how you were doing. I am sorry to hear about your computer. Geez. It never ends, does it? I know this, because it NEVER ends for me either. Oh well. Looking forward to seeing your new blog. Are you thinking BlogHer next year? Or maybe we could create our own Blog get-together, because, that is the purpose right, to meet other cool people that we talk with online. All that swag nonsense is driving me nuts. Okay, wow this is an extremely too long comment. I think they look like sisters. 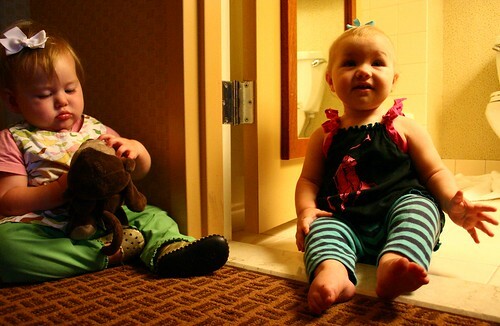 Both are adorable, just like their Moms. I don't like mine much because it's so long. I much prefer shorter domain names, and would change it if I wasn't already branded by it. I wish I could have gone just to meet a handful of ladies, and you were on the list. They are SO cute. And I'm still so pouty that I couldn't come meet you, though it was for the best reason ever. Oh, I hear you on the long ridiculous to repeat out loud blog name. I really like mine, but I run out of breath halfway through saying it. Oh, I am so thrilled that I got to meet you and hang out with you...we have total mind meld. And your baby is too freaking cute, and you DO TOO look like Ann-Margret. Can't wait to hear about your new URL. oh, those pictures...too much cuteness to even comprehend. sounds like you did everything you wanted & made the best of it all. i don't know meagan in real life, but i love her too. she ROCKS, just like you! Oh. my. stars. Look at those two and all those sweet baby rolls! How did y'all stand all that cuteness?!!! So glad you enjoyed Blogher. Can't wait to see what the new blog name to be is. Although, personally, I really love your blog name. But, I'm certain you two have come up with a spectacular new title. Oh, yeah...not that I've ever met you in person, but I absolutely cannot imagine not liking you. If you're like your blog then you would be awesome to hang out with. So, I'm sure they all love, love, loved you. I am so excited about your new blog name and I LOVED meeting you. You made a wonderful impression and I can't get over how cute both you and Alice are. I look forward to seeing you again. I am so glad you came, Erin! Awwwww. Hey, I miss you. Oh, they are cute together! Love those chubby cheeks! I am Steph's mom, Ivy's Mimi. These are the most adorable pictures of the girls. I am so glad you went and met these amazing ladies. I love you to pieces. You and that baby of yours made a great impression on me. I only wish I could have talked your ear off more, and you mine. You are lovely. Truly. I love that Alice and Ivy are hanging out in the bathroom, so punk rock of them. I see your other post is gone. I suppose that means drama... I sure hope my comment didn't start or add to it? I'm really sorry if it did.